Here’s something you see advertised everywhere: Bring your car into our service station for a complete free inspection by our certified technicians. Now you might think how nice, they care about me and want to do a good job. However, most of you know that this creates an opportunity to find some defect or improvement the auto shop can offer — at a fee of course. OK, so what does that have to do with security sales? 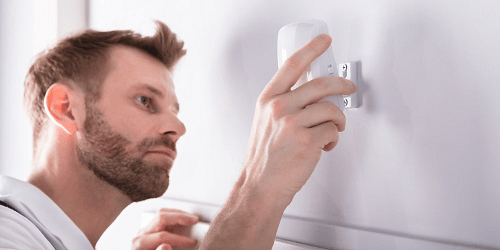 In today’s increasingly competitive landscape, I would guess many DIY, and even basic professional sales, are specified at the bare minimum as far as intrusion sensors and alarm monitoring. It’s my experience that DIY customers have very little understanding of alarm systems, sensors, features and services. Why not offer a free evaluation and inspection of customer’s existing systems? This can give you the opportunity to do the correct job for your new customers. Or offer free seminars or webinars on why and how one can improve their systems. Create opportunities to upsell. Let’s focus here on upselling intrusion technology. As often the case, let me start with an anecdote. It was early on in my own alarm company’s career that I had the opportunity to protect a small clothing store. I was impressed with the new acoustical glass-break technology. The store had much of the clothing displayed in front, where there were large windows. Wanting to be cost competitive I offered the customer an AGBD (acoustical glass-break detector) sensor for the front of the store plus a digital dialer and door contacts. Then one night I get a call from an angry customer that his front window was smashed, clothing stolen, and no alarm. What was the lesson for me? The AGBD should have worked, so at the time the blame was placed on the manufacturer and that along with a good contract saved me. I did learn in extensive testing in later years that many AGBD sensors can often not trip due to sound saturation, or too much glass-break sound. But one of the important lessons here is not to rely on a single intrusion technology. In my case with the clothing store one passive infrared (PIR) motion sensor would have made a big difference. Adding multiple sensors is a great upsell opportunity. When you quote a customer, do you give them only one basic, very competitive quote? Of course you do; after all you want to get that sale and another RMR account. What about offering the option of a good/better/best quote? It will give you a reason to explain to the customer in your professional opinion what they can get for their money. You might be surprised, with the right persuasion the best system will be sold. Also, this is one of the foundations of good sales tactics — it’s not whether they’re going to buy a security system, but rather which type they’ll buy. Most commercial security accounts have at least one installed PIR. But how many of your customers and sales prospects are familiar with how a standard PIR can be compromised or masked? Why not explain to them how a multiple-technology PIR works using both infrared and microwave detection? Devices such as the ISC-PPR1-WA16x from Bosch, the DX-60PLUS from Optex, and the PIR-T15AM from Takex offer anti-masking technology (see online version for links). Many of these devices can let an owner know with a trouble signal that their motion sensors have been compromised and masked during normal business hours. Police can then be notified and be ready for a possible afterhours burglary attempt. Many customers are not satisfied with an alarm and dispatch after the intruder has gained access to their facility or home. Reliable perimeter alarm systems such as AGBDs and infrared sensors can help address these concerns and be an attractive upsell item. New perimeter detection devices such as the FITLink from Optex present effective upsell opportunities. Such dual PIR devices are easy to install, wireless, weatherproof, animal tolerant and have long battery life. However, the selection, placement and testing of AGBD devices is paramount. One national monitoring service reported that a large number of AGBD devices were falsely triggered by the new audible nationwide federal emergency alert signal. I’ve also seen AGBD sensors that are not properly placed and tested, causing an alarm detection miss and thereby resulting in a very unhappy customer. True security professionals understand the importance of correct placement and testing of AGBDs. This can only be done per the manufacturer’s instructions. Make it a priority to get the correct tester for the job — throwing keys against the wall just won’t cut it. Create upsell opportunities by offering to test or replace a prospect’s inferior AGBDs.